Your Indoor Comfort Experts 24/7! Call (919) 803-3544 for a free estimate on system replacements. When it comes to keeping your home or commercial properties environmentally sound, air conditioning is a viable resource. Because not all buildings are constructed equally and thus call for unique air conditioning set ups, professionals should be called when you are in need to trustworthy air conditioning repair. You can flip through the phonebook or search far and wide online, but great value lives right here at Ultimate Comfort Heating& Cooling. Whenever you need quality HVAC contractors, they have you covered! Surprise interruptions in heating and cooling service are no fun. Not only can the absence of adequate cooling and heating disrupt daily routines, but it can very dangerous to your health. That’s why the professionals at Ultimate Comfort Heating & Cooling are “Your Indoor Comfort Experts 24/7!” That’s right; whenever you need them they are there for you! 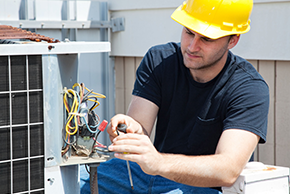 Your heating and air conditioning repair job is their number one concern and they will work industriously to ensure that you are 100% satisfied. No repair job is too large or small. In addition to providing you with exceptional repair service, their professionally-trained technicians are prepared to offer your dryer duct cleaning, central air condition service, and more. For your convenience and peace of mind, all of their technicians are NATE certified. This certification will let you sleep easy at night knowing that all of your AC repairs and installations are completed to industry standards. When Ultimate Comfort Heating & Cooling shows up to your house, you can count on unparalleled workmanship! The best thing for you is that their professionals can service any make and model air conditioning and heating system. If you are experiencing a problem, they can set things right again! When it’s time for service at your property go with Ultimate Comfort Heating & Cooling of Raleigh, N.C.!